Midfielder Nicky Law yesterday picked up the very first Cash Converters Player of the Month trophy for July/August. The former Rotherham star has made a sensational start to his Motherwell career with four assists and one goal to his name already. His presentation, prior to yesterday’s match, was slightly soured by Motherwell’s worst ninety minutes of the season but the 23-year insists ‘Well can bounce back against Hibs in the Scottish Communities League Cup this Tuesday. “We have Tuesday to put it right and everyone will be looking to do that,” Law said. “The longer it goes without a game it plays on your mind. But we will go out on Tuesday and that is a big game because we want to do well in the cups this season. 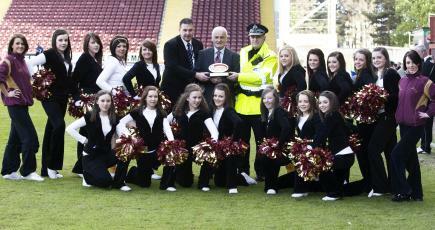 On his award, Law admitted he was delighted to be recognised by Motherwell fans for his start to the season. The Fir Park faithful have really taken to the Englishman and he is hoping to repay them with more good performances. “I am absolutely delighted with win this award and I would like thank the fans who voted and the sponsors, Cash Converters, for putting it all together. For your chance to present the September award, all you need to do is vote for which Motherwell player you think has been our stand-out performer over the last four weeks, and, if you are correct, you could be chosen at random from all entries received to congratulate our star man in person.